We went to a fascinating lecture at the University of Alberta the other night (June 15, 2015), where Professor Miguel Alcubierre of The Nuclear Sciences Institute of the Autonomous University of Mexico discussed his paper on faster than light travel (FTL). The theorized effect works via a bubble of highly warped space in which the traveler might move at arbitrarily high speeds relative to the Earth, yet never violate Einstein's Special Relativity postulate against matter reaching or exceeding the speed of light. The public lecture kicked off the conference of the Canadian Association of Physicists. It was one of a sequence of lectures known as the Herzburg Memorial lectures. Gerhard Herzburg was a German Canadian Nobel Prize winner, who made extensive breakthroughs in a number of fields. 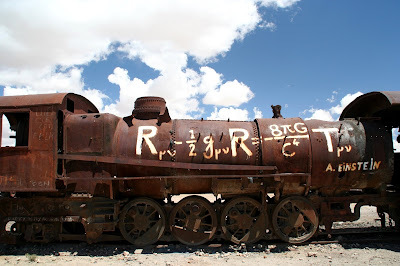 It was a public lecture, so it didn't get very technical – the only equation in sight was a slide of the General Relativity Einstein Equation, painted on an abandoned rail car in Bolivia. Very high class tagging, that. Experimental findings such as the Michelson-Morley experiments, that showed light's speed seemed constant in all directions, as the Earth moved in its orbit, which should not have been the case under standard Galilean relativity. Theoretical developments, such as c (the speed of light) being derivable from Maxwell's equations of electromagnetism, implying that it was a fixed universal constant. The realization that allowing matter to exceed the speed of light would be equivalent to allowing time travel, in some sense, an unsettling and paradoxical possibility. For these, and a few other reasons, Einstein decided that c must be a “universal speed limit”. That caused us to re-think a lot of things about time and space, particularly time dilation (moving clocks read slow), length contraction (moving rulers read short) and simultaneity (different observers don't agree whether events are simultaneous if they are moving at some velocity relative to each other). These odd effects have since been observed in nature (e.g. half-lives of particles moving near the speed of light that have been produced in particle accelerators are longer than those measured in laboratories that have not been accelerated). This finding about c, the speed of light, seems to have us in a pickle, or perhaps a pickle jar, as far as space travel is concerned. As Douglas Adams said in The Hitchhikers Guide to the Galaxy, space is big. If we are confined to traveling only at some fraction of the speed of light, it will take decades to reach even the nearer stars, hundreds of thousands of years to span the galaxy, and millions of years to reach even the closest neighboring galaxies. Obviously, this is a problem. That goes for both the space program and for science fiction. But, what Einstein and physics taketh away, Einstein and physics giveth back, at least in theory. It turns out that Einstein's General Theory of Relativity (GR), a theory that explains the large scale structure of the universe, has a few loopholes that permit a body to exceed the speed of light in a “large scale” sense, without exceeding the speed of light “locally” and violating Special Relativity (SR). One way of pulling off this trick is via an Einstein-Rosen bridge in space-time, colloquially known as a wormhole, to fans of science and science fiction (think of the wormhole in Star Trek Deep Space 9). This represents a legitimate solution to Einstein's GR equations, one that was noticed quite early in the development of cosmology. Mathematically, it is okey-dokey. The idea here is to “bend” space, so that in one part of our universe can be connected to another part, far off in space-time terms, perhaps in another universe altogether. One is supposed to think of how a worm takes a shortcut through an apple, traveling from one side of the apple to the other, without actually traveling on the in-between part of the apple's surface. The surface of the apple is analogous to our normal space-time, while the space within the apple is analogous to a higher dimensional space, which we can use to avoid the normal constraints of our space-time. Another analogy given is that of folding a piece of paper. By folding the paper carefully, we can bring two points that are far away on the paper's 2-dimensional surface arbitrarily close in 3-space. Then, jump that tiny gap, and there you are. Noted physicist Kip Thorne worked on this idea extensively, so that Carl Sagan could incorporate it in his science fiction novel “Contact”. It worked out pretty well in the book and movie, but in real life there are some issues. One is that it would take immense amounts of exotic matter to create the wormhole and keep it stable enough to allow ships and sentient creatures to use for transport. The equations say that the throat of the wormhole will close up with the slightest asymmetry (e.g. a ship going through it). I think another issue is “directing” the wormhole – there is no point in going through a wormhole and ending up just anywhere. Sagan got around this problem by having an incredibly advanced alien species do the engineering. That's an out we don't have. The other big idea is the Warp Bubble. Again, the term is well known to SF fans, via the “Warp Drives” of the Star Trek series and other SF books, movies and TV shows. Miguel Alcubierre worked out the math to this one in his PhD student days, and published it at the urging of his supervisor. Like the wormhole, it has mostly been thought of as a theoretical novelty, though recently some researchers seem to be taking the idea more seriously (e.g. some of NASA's advanced propulsion thinkers). Essentially, the idea here is to contract space in front of the ship and expand it behind the ship, thus allowing the ship to be pulled along within that bubble of space at arbitrarily large speeds. Within the bubble, no object or signal travels faster than the speed of light, but the bubble itself is displaced within the larger universe at speeds greater than c. The visual metaphor that the professor used was one of those moving sidewalks you see in large airports. The conveyor in front of you “destroys” space at one end and “creates” it at the other, carrying you along as it does so, while you remain motionless in your own little frame of reference (i.e. you don't move your feet). You might be thinking, this is a nice picture, but space isn't an airport moving sidewalk, so how can this be? We can't just go around expanding and contracting space, on a whim. Actually, the idea of expanding space is already implicit in cosmology. We know from red-shift observations, along with our knowledge of various “standard candles” such as Cepheid variable stars and certain types of supernovas, that the galaxies are separating from each other. This is considered to be excellent evidence for the expansion of the universe, which can be thought of as a stretching of space in between the galaxies. Eventually, galaxies on the other side of the observable universe will recede so much that we won't be able to receive a signal from them. They will drop below the horizon, so to speak. In fact, in the earliest stages of the Big Bang (the theory, not the show) the consensus is that the universe must have expanded at an incredible rate. So, the idea that space can expand or contract at “arbitrarily high speeds” is accepted wisdom in cosmology. Add to this, the fact that the most recent observations show that the universe isn't just expanding, but it is also speeding up. People have already been awarded Nobel prizes for that finding, so it considered very reliable within the scientific community. There is a catch, of course, and that catch is something called negative energy. It is basically what you need to insert into the equation, to back-solve them in such a way that you get a warp bubble to form – i.e. you curve space in just the right way. Since mass and energy are intricately related via E=mc2, you can think of negative energy as negative mass, i.e. mass with anti-gravity. Such exotic matter is not forbidden by theory, though it has never been observed in the lab. Yet, it must exist, as it is needed to drive the acceleration of the expansion of the universe, as noted earlier. Indeed, it must not only exist, but the bulk of the universe (about 70%) must be composed of this negative or dark energy. Note that the term “dark energy” is just a placeholder term for an unknown, and shouldn't be thought of literally. Nobody knows how you could produce this stuff or how much of it you would need to produce. Presumably, some sort of ring type structure would be used, as the “bubble” would be quite symmetrical. Perhaps some quantum process might unleash this stuff, if you could generate sufficient energy in a particle accelerator of some type. The professor didn't really go into that. I suppose that is a job for some future Star Fleet engineers. Herzburg Memorial lecture, June 15 2015. 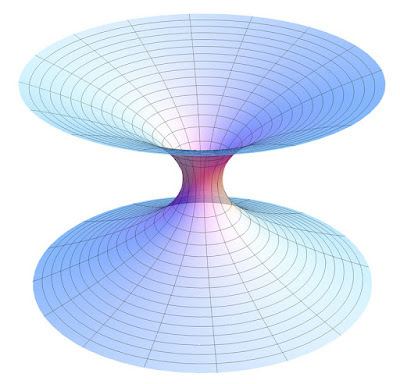 The Warp drive: hyper-fast travel within general relativity (M. Alcubierre, Class. Quantum Grav. 11 (1994 L73-L77). Supersymmetry Breaking Casimir Warp Drive, 2007 Space Technology and Applications International Fourm. Warp Field Mechanics 101, Dr. Harold “Sonny” White, NASA Johnson Space Center. It�s hard to come by educated people in this particular topic, however, you sound like you know what you�re talking about!